In the event of a no-show, Hotel-Pension Rea has the right to charge the guests credit card for the first night. Moreover, is only 300m from the famous Archaeological Museum, the old Venetian Port, the Natural History Museum and the central market. Bus stations are also only a short walk away. Quiet, comfortable and very reasonably priced and it is also a perfect choice for individuals who travel by themselves. The hotel features 37 beds, in 16 comfortable rooms, most of them with balconies. All rooms have air-conditions. There are double, triple and quad rooms available, some of them are provided with private toilet and shower. 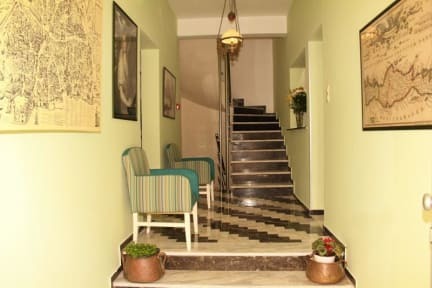 A fabulous little hotel in a very quiet street in the heart of Heraklion and very handy for the ferry, the town, the museums and the bus to Knossos. Friendly and informative staff. I am already planning a longer stay. Highly recommended. We only stayed one night but this place made us wish that we stayed longer! Wonderful area with a great atmosphere. Very friendly reception staff who were accommodating even to our slightly late arrival. Easy to get in contact with and good level of English. Room was clean and modern with facilities including a fridge and sink in the room. Shared bathroom was clean and just opposite the room. We chose the 3euro per person breakfast buffet which had a good selection: yoghurt, cereal, bread, cake, jams, coffee, tea, boiled eggs. Easy to reach, near the town. 20 minutes walk from the bus station. We had a very short stay, as our ferry arrived 3 hours late and then we left pretty early the next morning, but this place was great! Staff super friendly and helpful, clean, great location, and nice room w a good bed and shower. We were very happy with it! Wish I spent more time in heraklio it was very cool. Lots of good night life right outside the door but amazingly quiet considering. 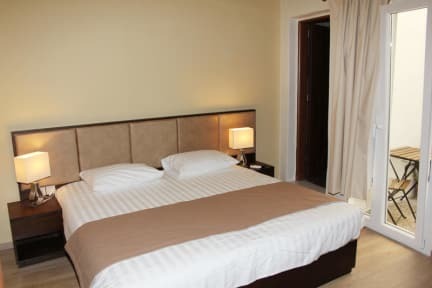 This small newly fitted out hotel is extremely clean and comfortable. Most places of a similar standard would be far more expensive. The desk staff were very friendly and the free lockers for left luggage were very handy. Very clean room that was quite modern. Staff was nice. Good location. It was much like a hotel and the staff were really friendly and helpful. It is not a hostel atmosphere if that’s what you are looking for and there is no common area to hang out and meet people but that’s okay if you are travelling with people or are just looking for a nice clean place to stay. Definitely would recommend this place due to its great location, cleanliness and amazing staff! The room and bathroom are very clean. Locked doors by key card. Nice place to sleep, but not to hang around as it is basic, but good. This place was more of a hotel than hostel as there was no common area. The hotel was dark and the room had an old musty smell. The shower had black mold or something like that around the edge, it was gross. I was there for one night and definitely wouldn't feel comfortable being there for any longer.